I’ve been collecting antique or vintage cup and saucer sets, and every time I go to America, my American friend, Gay takes me to some antique shops. I love going antiquing. While I was in America last time, Gay took me to an antique mall that was new in Flint, Michigan. I really enjoyed shopping because the mall was huge and I could see a lot of vintage or antique stuff. While I was enjoying looking around with her, I found a small matching cup and saucer set. I thought it was very pretty. I overturned the cup because I wanted to make sure where the cup came from. 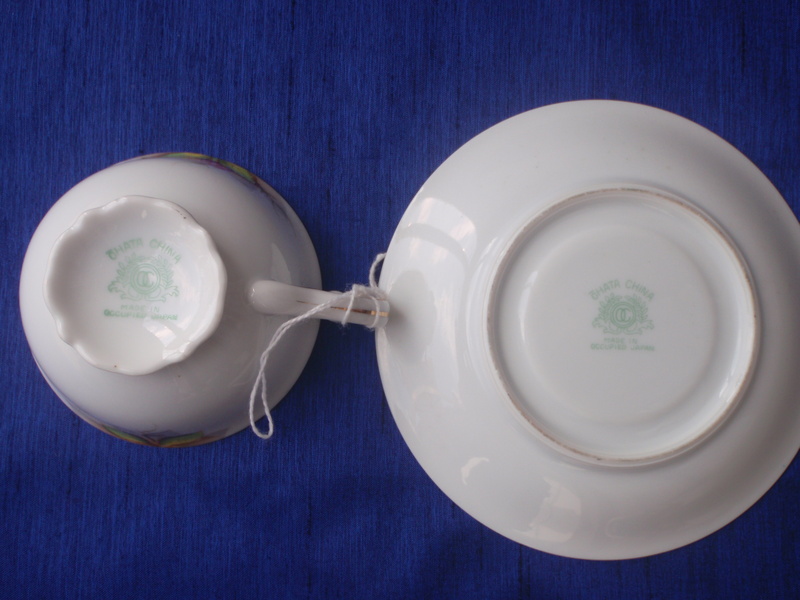 I especially love collecting British cup and saucer sets. They are very elegant and have a lot of details. Most of them are not hand painted, but I can get a lot of painting hints from the sets. When I overturned the saucer, I found a very interesting mark that I’ve never seen before. It said “Made in Occupied Japan, Ohata China”. I’ve seen made in Japan china many times at antique shops in America and am used to it, but it was my first time to find occupied stuff. Since I couldn’t understand the meaning of it, I asked to Gay. She told me that it wasn’t happy for me, but it had been created while our country was colonized by America after World War 2. I thought it was very interesting and found a part of our history! I bought it. After getting home, Gay searched about occupied stuff for me. She told me that it had been created from 1945 to 1952. I knew our country lost World War 2, but I’ve never seen the proof. To be honest with you, I was very shocked.After I returned to Japan, I also asked to my Texan friend, Matt about the occupied stuff. He also helped me to find some links.I found that during our country was colonized by America, we had to print the mark “made in occupied Japan” on all our export things. I didn’t study it at my history class. I asked to both my husband and daughter if they studied it at school, but both of them also didn’t study. The occupied stuff are exported things, and that’s why we haven’t seen them in Japan. I also tried to search about “Ohata China”, but unfortunately, I couldn’t find any information about the china company. I guess we already don’t have the company in Japan any more. I’d love to show the matching cup and saucer set to my parents. They might know about it more. I’m happy to be able to find a part of our history in America! If you know some information about it, could you tell me about them? I’m looking forward to receiving a lot of information from you! Previous Cherry blossoms in my town Next Thank You So Much! Thank you for the comment! I’m happy that many people are also interested in this story! If I can get some more information, I’d love to share it with you here! If you can get some more one, please share it with me here!!!! I owed the occpied cup and saucer before. But I sold it at the garage sale this spring…hahaha. I also didn’t know about the proof of it since I got it. You can see many occpied china in antique shop in America. I’m sorry I don’t know much about fo it, but my cup and saucer didn’t have any brand name on it. Just said “Occupied Japan”. Maybe many potteries involved that kind of work and they could get foreign money through that export under occupied period. I’m very curious about yours. 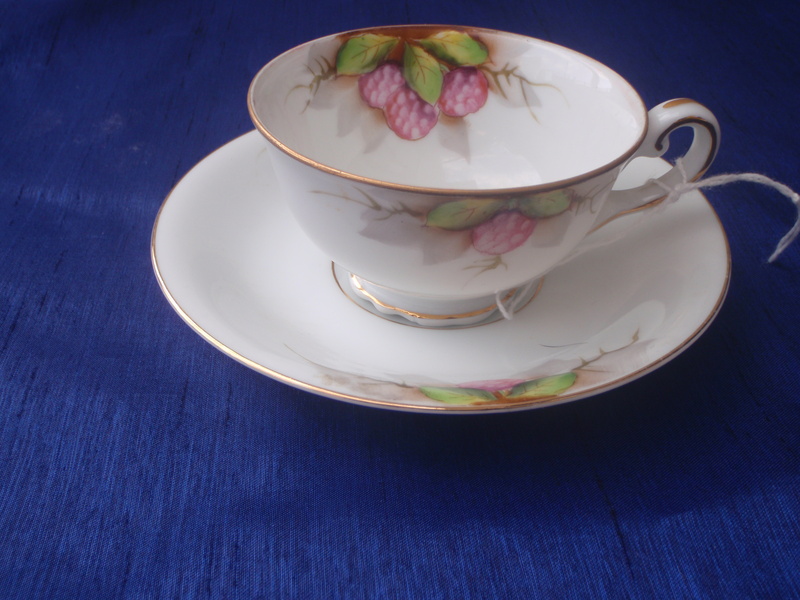 I know even they aren’t occupied stuff, Japanese vintage cup and saucer sets have really high quality! I’d love to collect them from now on! Thanks for visiting my blog again. I am sorry that I don’t know about the value of your dragon porcelain. I hope you can show them to an antique dealer. Then, she/he can tell you the value. I am sorry that I can’t help you. No worries! I can understand and I always make a lot of mistakes in my written English, hehehe! Thank you so much for the comment! Yes, it is very beautiful and I bought it only for three dollars, lol!!! As a historian, I find this very interesting. Thanks for sharing! Long time no see! How have you been? Have you still been studying Japanese? I’m so happy that you visited my blog and left the comment! Thanks for the comment! I’m glad for you this story is interesting! Thank you so much for the comment! I’m looking forward to seeing your cup and saucer sets!!! What a beautiful cup & saucer set! It must be so much fun antiquing in the U.S. Are there many antique stores in Japan? This is a really interesting period of Japanese history. It’s amazing that you had to go all the way to the U.S. to learn about it! What do you learn in school about post-war Japan? Thank you so much for reading the blog entry and leaving the comment! We have both Japanese style antique stores and Western style antique stores. We also have some pawn shops. We learn about WW2, but I didn’t know that America ordered us to print the mark on all our exported goods. I didn’t know the part at school. I think our education system is quite good to control young students not to become anti-America. I’ve never thought negative feelings against America even thought America dropped atomic bombs twice. I think our education has been working out for Japanese people very well. History is not taught very well in Canadian schools! We learn very little about WWII, and almost nothing about what happened in the Pacific region during WWII. Most of what I know about WWII in the Pacific comes from watching American movies! I am so thankful that I have been able to meet so many wonderful Japanese people on Twitter! I have learned so much about Japan. I would love to visit someday! I’m so glad that you are interested in our culture! I hope we can meet in Japan some day!!!! The following is a compilation of research from different thoughts on Occupied Japan markings. There are varying opinions on the history of this marking. “The unofficial occupation began when Emperor Hirohito broadcast the unconditional surrender on August 14, 1945. Officially accepted by General Douglas MacArthur on board the U.S. Battleship Missouri September 2, 1945, the new Japanese Peace Treaty was signed and became effective on April 28, 1952 restoring full sovereignty back to Japan and thus ending the Allied Occupation. As Japan needed to rebuild their economy after the war, part of the agreement to allow them to export goods out of the country was they had to mark 50% of all items with “Occupied Japan” or “Made in Occupied Japan.” They could do this with a paper label, cloth label, engraving, handwritten or stamp. You may come across things like a salt and pepper set, where only one of the pair is marked OJ and the other will just have “Japan” on it. 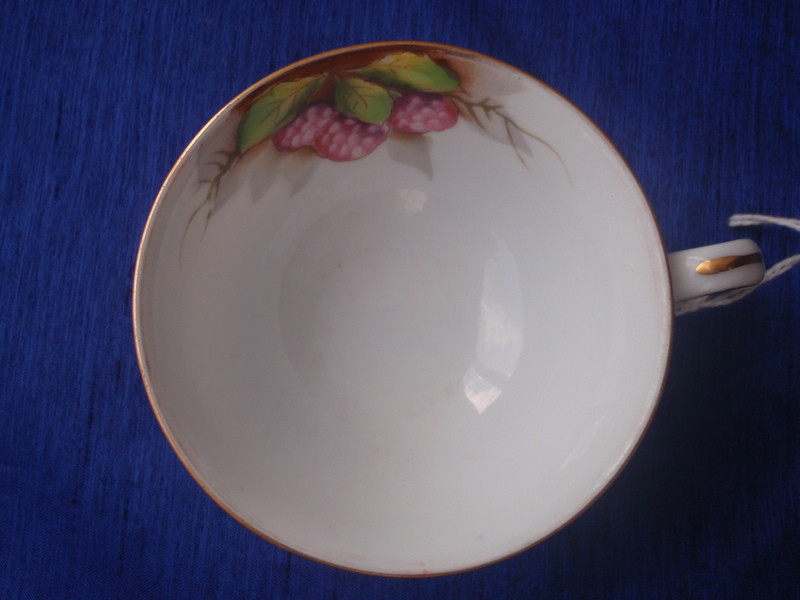 In my research of my Ohata china pieces, I have found that the mark that keeps coming up is not the one on my china. 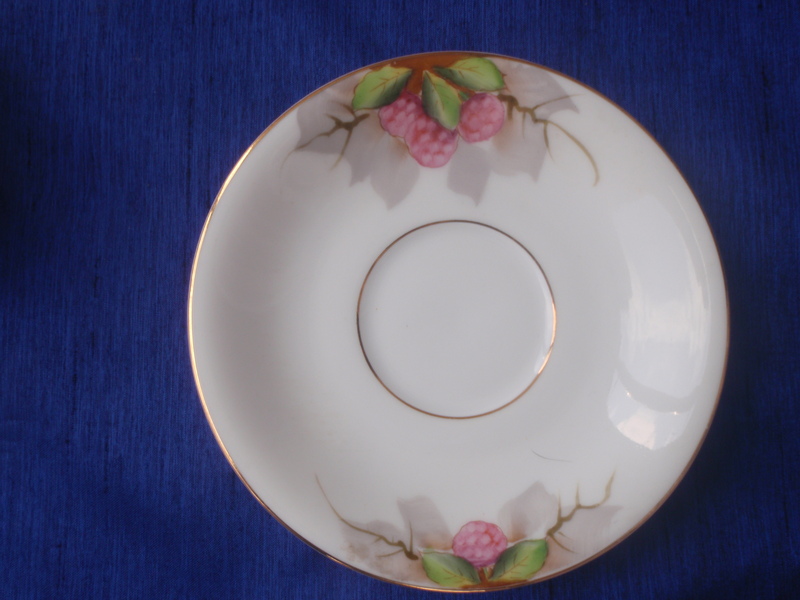 It seems to have been redesigned and is a much lighter, “happier”, flowing and simple china mark. I believe my mother got this china in the late ’50’s or early ’60’s. If you are interested in seeing the china mark from my china, I will see if there is some way I can get a picture of it to you. 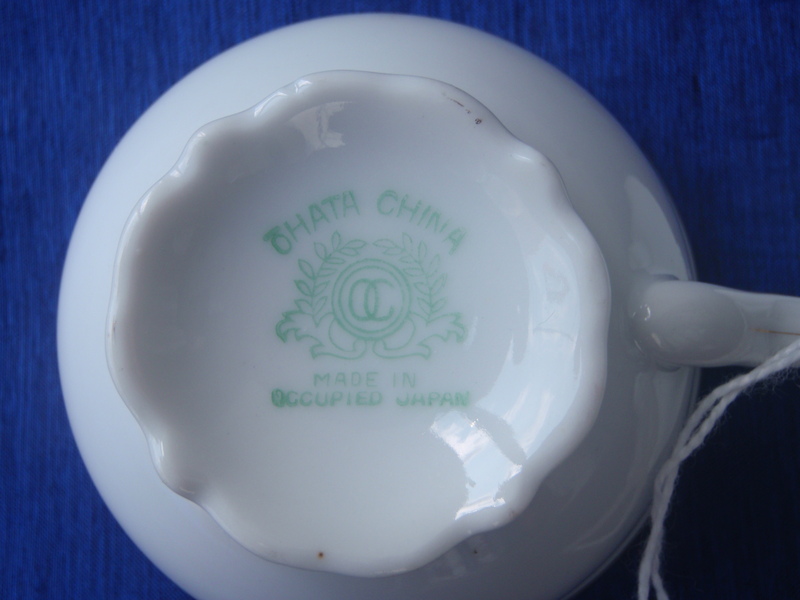 I am trying to find out more about the Ohata China Co. and it’s history. Not much about it online other than samples of their work. Wow, thank you so much for such the long comment! I really enjoyed reading it!!!! Yes, I’ve been collecting the occupied Japan stuff and every time I go to America, I can get something. My collection is getting bigger. I have to show my collections on another entry some day. I’m very curious about ohata china because it’s gone and nothing. If you can get more information, please let me know. Thank you! Thanks for the link and comment. I’ve tried to search about the Ohata china, but it’s still difficult for me to do it. I know Noritake, Fukagawa and Okura. Those three are representative Japanese china companies now. I guess Ohata was in the Nagoya region because at the time there were so many small china companies there. I’ve been keeping on looking for some information about the company and when I get some of it, I will let you know! My husband inherited 2 plates that say Ohata China, Made in Occupied Japan. They are dessert or salad size, have the same markings on the back as yours do, but the designs on the front are both full, in the center of the plates. One design is of strawberries and flowers, leaves. The other had what look like a white fruits with leaves. The artist had the same style as your plates. Thanks for the comment. Wow, I’m very curious about your hubby’s china! Thanks for the comment. I hope you can sell them. jSorry, I didn’t get to leave my email and name of the January 17, 2023 comment. Thanks for the comment. No worries. I can know your email via the comment. Thank you for posting the information about the Ohata China. Going through my mother’s items I found a Tea set that matches your cup and saucer. It was real interesting to read about the history of this china. Welcome to my blog! Wow, I am so curious about your mom’s collection! They must be very pretty! Good for you!